It was sometime in college, or possibly a little thereafter, that I first heard about absinthe. All I remember is a friend telling me that it tasted like mouthwash. Well, I liked mouthwash then and I still like it today. The only thing is, now I don't drink it. Absinthe has been technically illegal in the United States since about 1910, so I never did get a chance to try what is affectionately known as "The Green Fairy," or, if you happen to be anywhere near the Balkans where an inferior version is distilled, "The Green Death." What is absinthe? Well, you could call it a liqueur, or spirits, or bitters or an apertif. Predominantly produced and consumed in Europe (where the EU has recently legalized it), the best brands are French and Swiss. It is known for its high alcohol content, which often exceeds 150 proof, and for its unique distillation process, which involves the use of several bitter herbs and oils, not the least of which is wormwood, and its primary active ingredient, thujone. Thujone, as it turns out, has an infamous history. As a component of wormwood oil, one of the bitterest natural substances known to exist, it plays a key part in the absinthe folklore. It is also the main reason that the FDA has banned the distillation (though not the possession) of absinthe in the United States. It seems that thujone is at once somewhat psychoactive, as well as quite poisonous, in large enough quantities. As my sister Sue has said, there are plenty of other foul-tasting alcoholic products on the market, so I guess this was an easy one for Western nations to ban. The fact that wormwood oil was known to cause seizures in epileptics didn't help. Even in Switzerland and especially France, where absinthe had sort of a cult following with the artistic underground, its possession became illegal after the turn of the 20th century due to fears that it caused insanity, apathy (which was a big deal in the years leading up to the first World War), lessening of sexual inhibitions and last but possibly not least, death. Still, afficionados found a way to get their fix and distilleries started popping up in Eastern Europe, catering to niche absinthe markets on the Continent as well as a strong following in New Orleans, which often honors the French tradition. 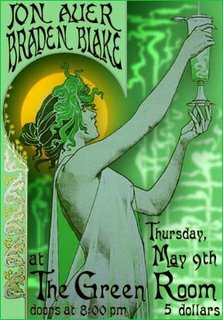 Speaking of tradition, absinthe is often consumed, even today, in the time-honored manner where one pours a certain amount of the beverage into a glass goblet, which is then diluted with an equal part of water, poured over a cube of sugar, supported on the rim of the glass by an ornate spoon. This process of dilution produces what's called the "louche," which is a swirling-up of the absinthe's essential oils, intensifying the the drink's green color and producing, it is said, an almost hypnotic state in some observers. From the little research I've done, it appears that absinthe can be ordered over the Internet from European retailers for legal delivery to the United States. Its cost is about $40-$75 (+ shipping) per half litre bottle. It is also available in parts of Canada, including British Columbia, where the thujone content is strictly controlled. I understand that it is allowable to bring it across the border. I may be going up to Vancouver in the next couple weeks and I have every intention of bringing back some absinthe. I'm only discouraged by the knowledge that my dear sister Sue has preemptively declared her lack of interest in the requisite absinthe party. She has done her own research and calls the liquor "Vile, contemptible, dangerous and illicit," or words to that effect. And yet she still doesn't want to try it. She did admit, however, that it would probably make an excellent rat poison. Well, all is know is that if it tastes anything like mouthwash, that's good enough for me. And I hear it doesn't have that minty methyl-alcohol aftertaste, either. I'll give you a full and objective report in a couple weeks. In the meantime, for more information on absinthe, just google it. premptively? peremptorily, - "not allowing contradiction or refusal", that would fit the occasion.